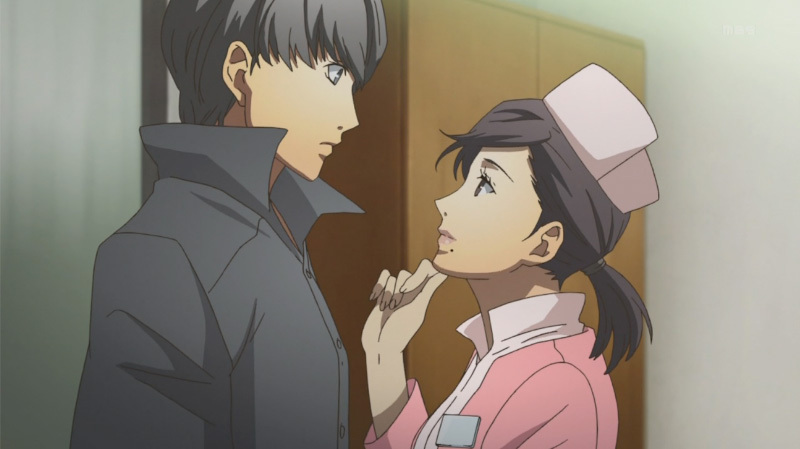 When all is said and done, Persona 4 may have its flaws, but, as a whole, it's definitely worth your time. Persona 4 was released on PlayStation 2 back in 2008, during a time when Sony was transitioning from the PS2 to the PlayStation 3. Because of this, it failed to catch on with the larger gaming audience and not many got a chance to play it. 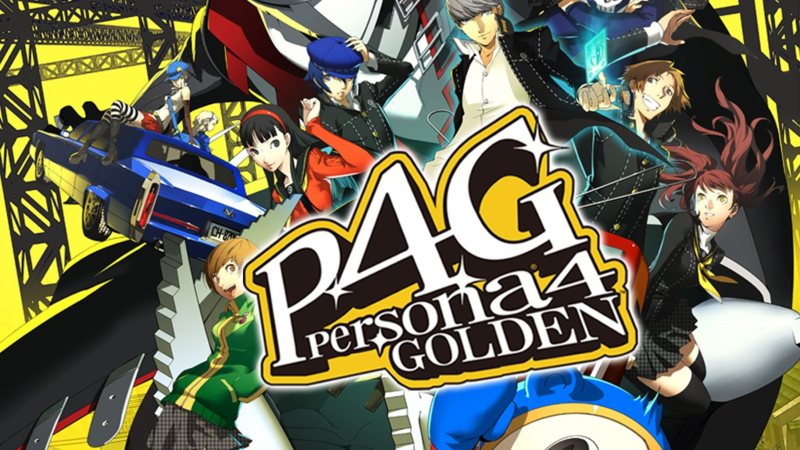 Thankfully, with the release Persona 4: Golden for the PlayStation Vita, the game finally found its home. For the uninitiated, Persona 4: Golden is an HD port of the original game, which can be described as a social simulation/dungeon crawler RPG hybrid. 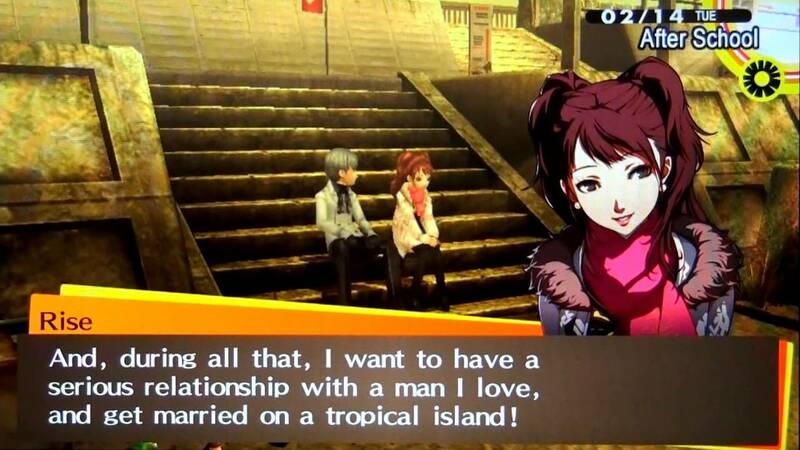 Persona 4 admittedly has a slow start. It took me around five hours before I even got to explore the town of Inaba. 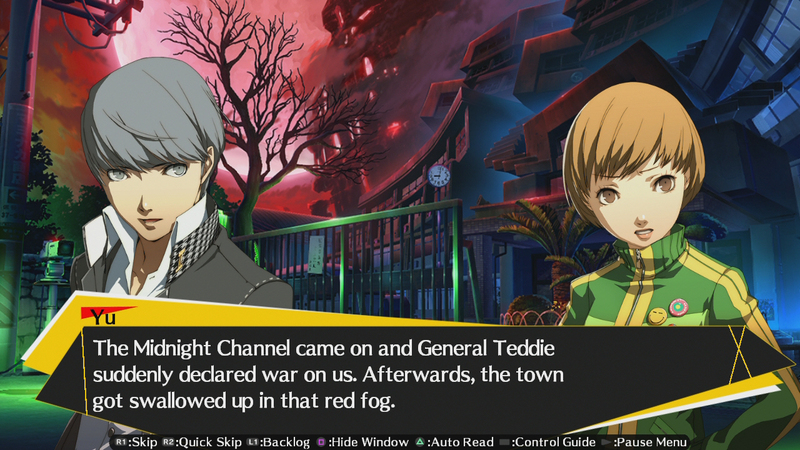 Thankfully, unlike Final Fantasy 13, the first five hours of Persona 4 isn’t spent walking in a straight line. Instead, it’s used to engross you in the lore and ease you into the world. Character interactions feel genuine, and the characters are diverse enough to the point where I actually remembered their names. After a series of murders that occur in the small village, you and your friends stumble into an alternate TV world, where you try to find who has been broadcasting the Midnight Channel – a channel that allegedly caused the murders. Within the TV world, you will meet and unlock Personas of you and your friends. These alternate versions of have been hidden inside their minds because they don’t want to face the truth about themselves. The game has a very strong message about being true to yourself and accepting what other people think about you, but it doesn’t beat you over the head with this lesson. 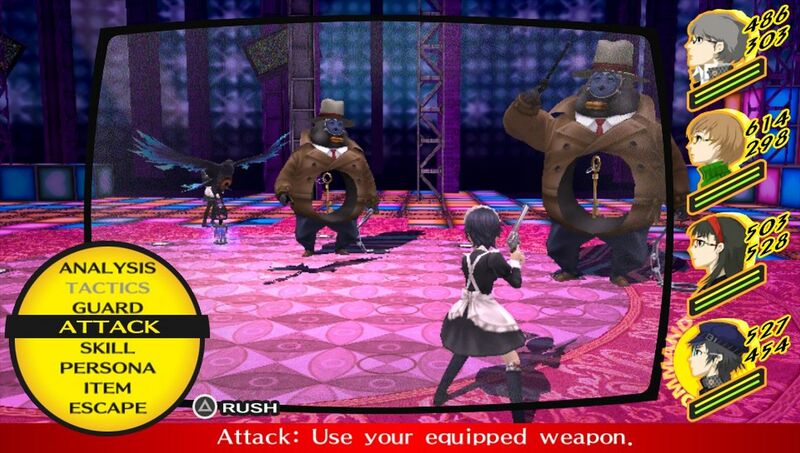 Persona 4 is very much your standard turn-based RPG, but the addition of personas help mix things up. Once per turn, you and your teammates can switch between different personas. Doing this doesn’t cause that character’s turn to end, so you’re encouraged to switch personas frequently. Having different personas also increases the chance that you will have one who is immune to your enemy’s attacks, which adds another strategic aspect to the battle system. Most enemies have elemental strengths and weaknesses. Fire is weak to water, water is weak to ice and lightning and so on. Most personas are assigned an element, and when you swap them out, you take on their strengths and weaknesses. The game encourages you to be brave and awards you for your bravery by increasing your courage meter every time you say something brave during a scripted sequence. This is why it’s ironic that during the time you spend with your friends, you’re forced into behaving a certain way. 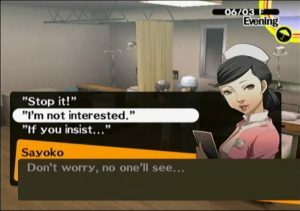 This is the main reason why I hate most social simulation games as they often force you into sucking up to someone by giving them what they want, and Persona 4 is no exception. What’s more, not sucking up to someone could actually end up costing you your life. 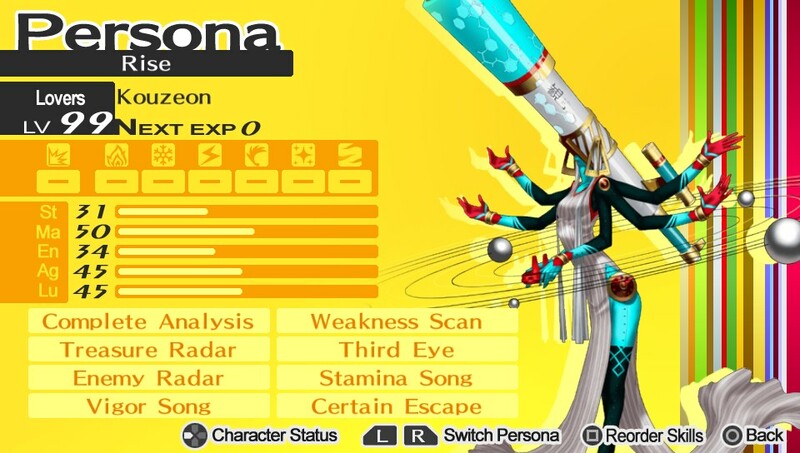 In the world of Persona 4, all the major characters are represented by a type of creature called a persona. These personas are sort of like Pokemon, only they fight with you instead of for you. To power up your persona in the dungeon crawler part of the game, you have to strengthen your relationship with a character who reflects that persona’s type in the social simulation aspect of the game. Yeah, I know, it sounds confusing, and it takes some getting use to, but you’ll “get it” before too long as you continue to progress through the game. Every day in the game is split up into five portions: morning, afternoon, midday, evening and night. Each time you interact with someone in a special way by choosing to spend time with them, it moves to the next portion of the day. This time commitment provides you the chance to increase your social link with that person, which will in turn increase the level of persona you can create under that social link. For instance, if you want to increase a persona who is a power type, you need to spend time with someone in the real word whose social link represents that type of persona. Normally, this wouldn’t be so bad, but this means that you always have to say what the game wants you to say and not what you’re actually thinking. For example, I was talking to a girl who loved to eat meat, and she asked me if I also liked meat. I responded by saying that I like fish and because the answer was something she didn’t like, I didn’t get as many points as I would have if I said I liked meat. Another time, I was on a date who was being a total b*tch. I tried to teach her some manners by saying how I really felt, and my social link became blocked until I apologized. So the lesson here is always agree with what your friend’s interests are; otherwise, they will leave you. But perhaps the biggest offender of this game is one of the side missions. 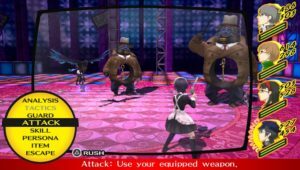 In Persona 4, you’re able to get jobs to help you earn money to buy weapons, armor and other supplies to use when you go into the TV world to fight monsters. One of the jobs is as janitor at a hospital. One of the optional social links called “Devil” can be found here, as well. 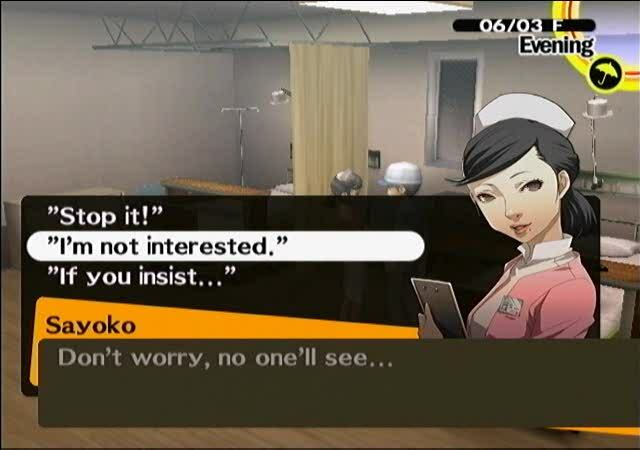 To increase this social link, you have to consent to being groped and sexually harassed by a woman who is more than 10 years older than your character who’s supposed to be a 14-year-old high school freshman. Yet, in order to increase your stats, you have to tell her that it’s okay to kiss and flirt with you. She suffered from a breakup and now preys on young boys to satisfy her need for attention. Another area that I find issues with is that, for the most part, none of the dialogue choices you make affect the story. However, during one key moment, you’re asked nine questions with three different answers you can choose between for each. Choosing the wrong answer will cause the death of a certain character and result in a non-canon ending. Of course, the first time you play the game, you’re not going to know that. This means that the first time you play the game, you have a one in 27 chance of getting the correct answer. In fact, you might not even know if the ending you got was wrong. Other than that, though, the writing is top notch, and the voice acting is very good … even the English dub. Though one moor bear pun from Teddy and his annoying voice is enough to make me want to go on a genocidal rampage and kill every bear in the world. 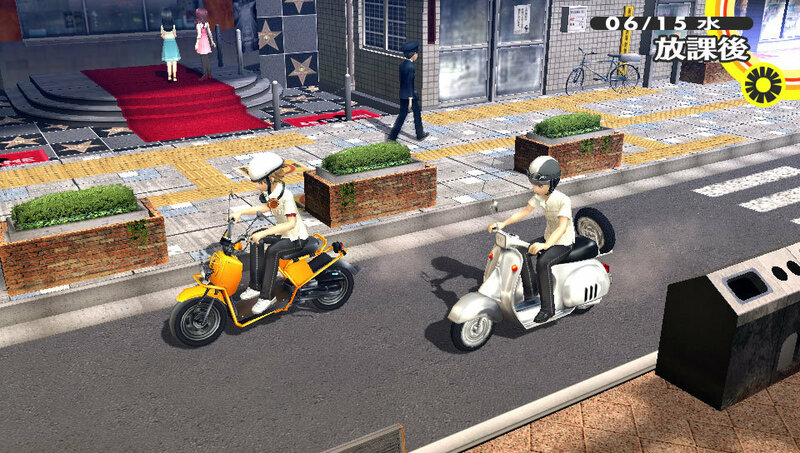 Also the Vita version adds an extra side mission to help increase your social link with Nagato and Dojima – two characters whose social links were very hard to max out in the original game. The Golden version also adds a new character to interact with named Marie. She was a character you talked to in the original game, but now she has a social link. This lets you get to know her better as you get to spend time with her, which adds a bit more replay value to the Vita version. There is also a New Game+ mode that allows you to carry all the personas you’ve earned, as well as keep the courage, knowledge, understanding, expression, and diligence personality types you amassed through the first playthrough. On your second playthrough, it’s also much easier to answer certain questions. Let’s say you were asked a question on your first playthrough but didn’t have enough of those five stats to answer. This is a great way to add replay value as some of the dialogue on your first play though is blocked off until you have increased all of your social qualities. The game also has a great soundtrack! While I wouldn’t buy the CD, it’s definitely entertaining to listen to and helps add to the overall experience. 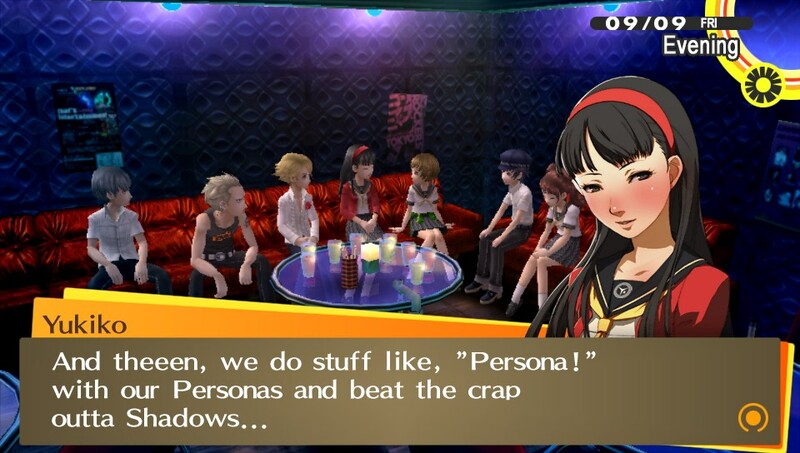 When all is said and done, Persona 4 may have its flaws, but, as a whole, it’s definitely worth your time. Hell, I “platinumed” the Vita version, and it took me 276 hours, so don’t let the negatives steer you away from the game’s positives.